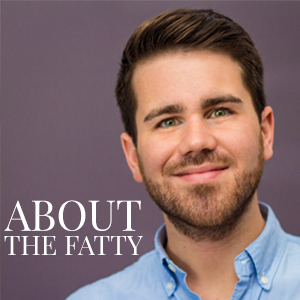 With Thanksgiving and fall dishes in full swing within most kitchens this week, I wanted to kick things off with something simple but unique. 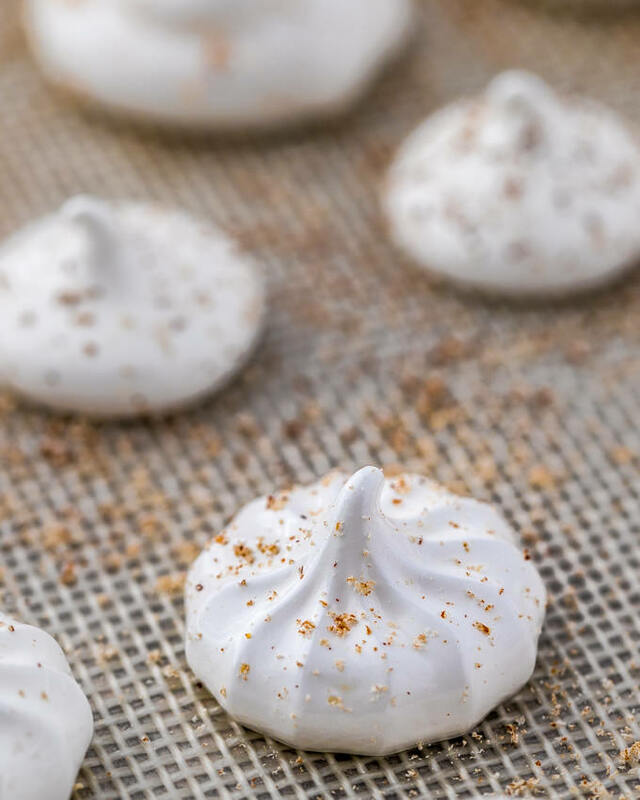 If you’ve looked back at a few of my recent desserts, you’ll notice that I’ve been pretty keen on decorating them with meringue. 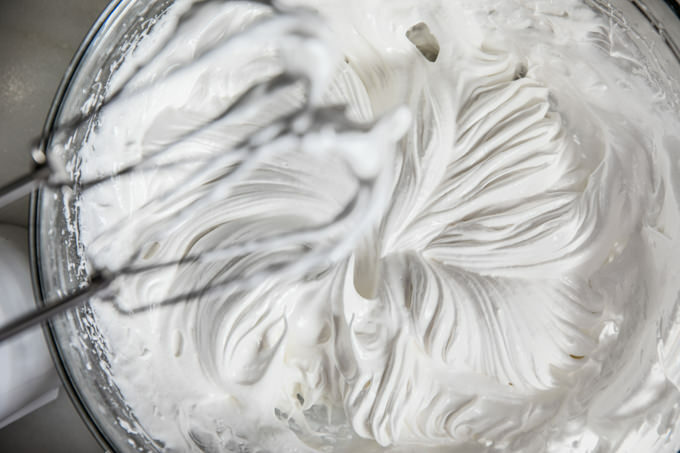 Meringue kisses, pavlovas, swirls. It’s just so much fun to pipe out all of the different shapes and then bake them until they are ready to dissolve on first bite. 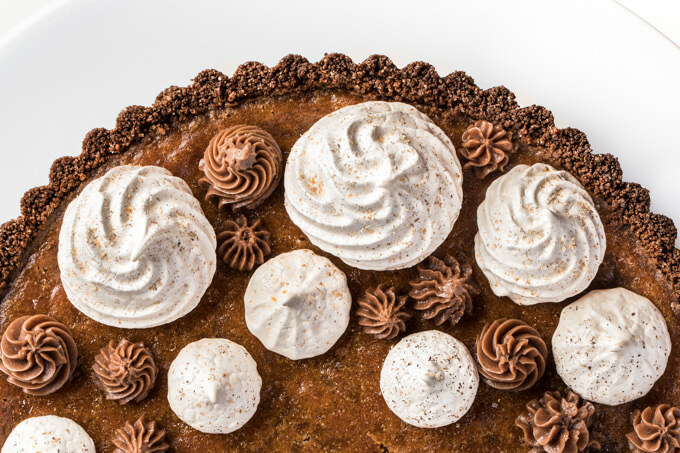 Instead of decorating your pie with a plop o’ whipped cream, why not give something new a try? 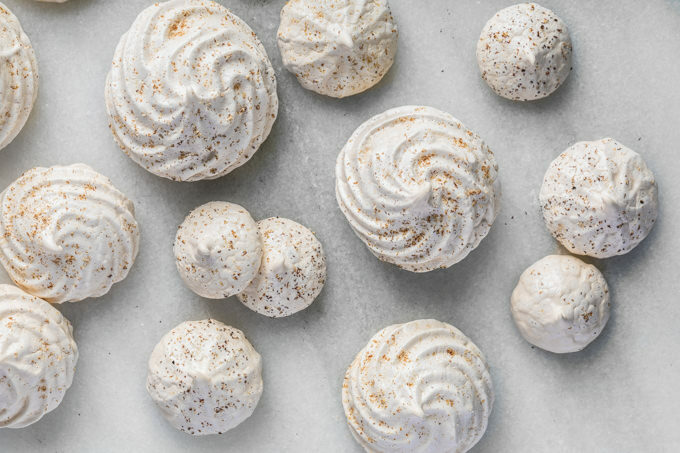 Nutmeg meringues. Just for y’all. These lil pups would be awesome in some hot chocolate, eggnog, coffee. 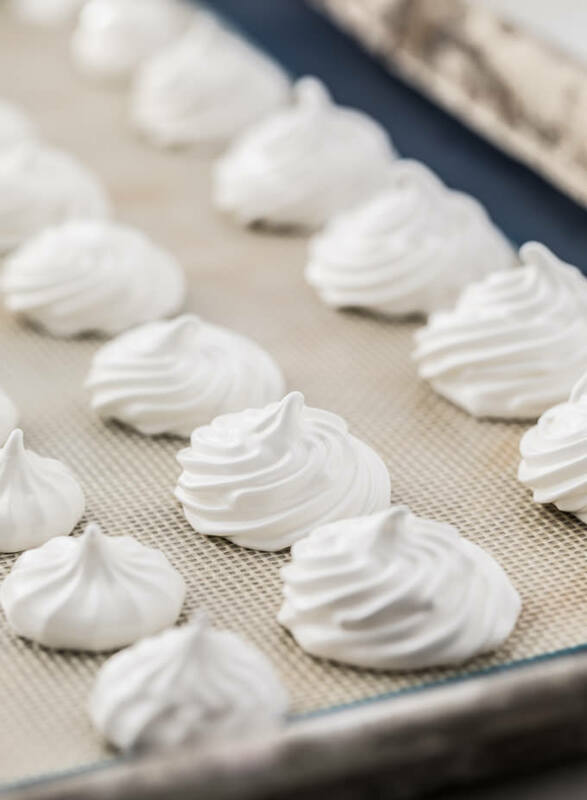 The lighter than air texture and melt in your mouth richness that meringues give has always intrigued me. They are surprisingly easy to make when you follow a few simple rules. Dry bowl, best to keep things room temp., and time, time, time. They can’t be rushed. Take your time and you will end up with something wonderful. Even Fendi approves…. 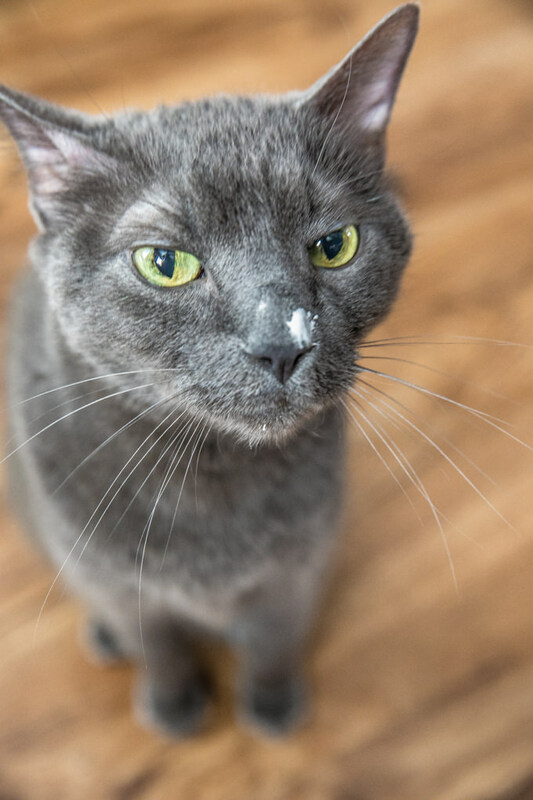 even if it was because he managed to jump on the counter and find the empty bowl when I walked out of the kitchen for a hot minute. At least he was kind enough to pose for a picture while acting like I hadn’t noticed what had just gone down. I was lucky enough to get most of the sweets into the oven. Y’all. The smell that comes from the oven when these babies are cookin’ is just amazing. That classic, warm, rich fall favorite mouthwatering smell that everyone loves to have coming from the kitchen. 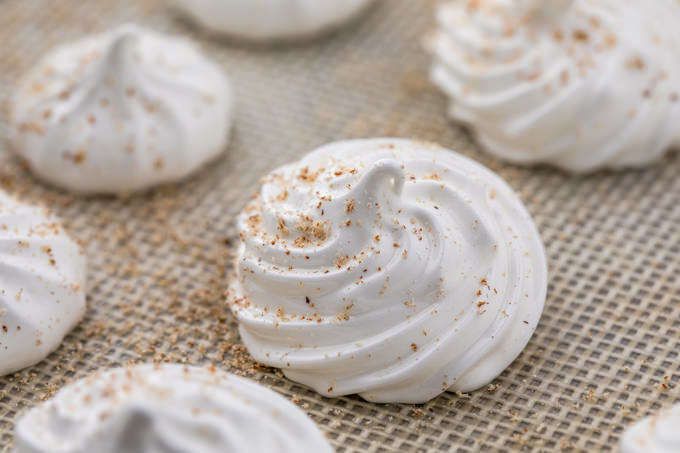 Classic meringues with a swirl of freshly ground nutmeg is definitely going to take grandma’s dessert recipe to a whole new level. This is an office party baking contest win for sure. PS – Subscribe to our e-mail updates newsletter to see the recipe for that beautiful tart from the feature photo later this week! ½ cup egg whites (~4 eggs), room temp. Sift both sugars together and set aside. Place room temperature egg whites in a very clean mixer bowl. Beat on medium speed until foamy. Increase speed to high and beat to soft peaks. Very slowly add sugar by tablespoons until incorporated. Beat until very stiff and glossy. If desired, add nutmeg into last few whips of the mixer. Alternatively, sprinkles nutmeg on top after piped. Transfer to piping bag and pipe onto parchment or silicone lined baking sheet. Bake for about 2 hours. 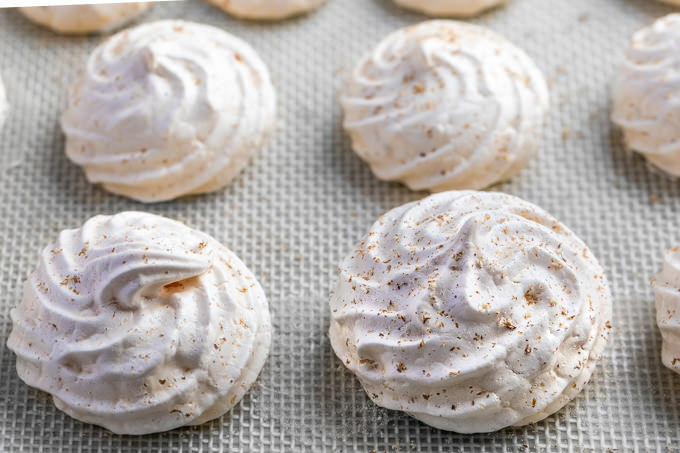 After baking time, turn off oven but leave meringues in. Let sit for additional 2 hours (or even overnight) until cooled completely. Use to top favorite desserts, or enjoy topped with fruit for a treat. Favorite fall holiday dessert? Let us know! I love meringues. I normally do chocolate chip meringues so I will have to give this new spin a try! Give it a go! They’re delicious.